After some moderate bushwhacking through stinging nettles I emerged on the top of greatest line I’d seen for hundreds of miles. This was a perfect steep grassy slope leading all the way down to the Missouri River. The 300 feet of sustained 40 degree slope was flawless, with gullies and ridges (shall we call them Iowa “spines”, kind of like Chugach Spines, but not really). When you search for “Iowa” and “backcountry skiing” a particular site comes up near the top, and when you go there it says “No adventures found”. I have to disagree. 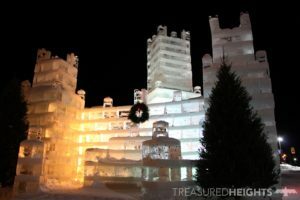 As you’d expect we would, in the Treasured Heights Skiing States series we get everywhere, and this includes the great state of Iowa. It has some cool topographic features and a northerly position compared to many other plains states so it can get a sufficient base needed for exploring the “backcountry”. After a long and perilous ascent I stood on top of Iowa. I gazed down upon the children of the corn, wondering if I could ever top this moment in my life. Most of the land area of the state is not fun for skiing (not a surprise), and that is not because it is as flat as a Monsanto engineered wheat-flour pancake. The state has lots and lots of cool little valleys and ridged hills, it even has crags to climb on or ski off of. The problem is that the hand of humankind has wiped out almost all natural areas thanks to the land lust of the 1800s and continued industrial farming. This being said there are hidden gems around the state for cross-country and fun backcountry ski laps, luckily these pockets of nature are big enough that you can feel far from civilization when you are in the middle of them. I some places where the view isn’t wild you can at least you can get some fun downhill laps above the iceflows on the Mississippi River. The first place I hit in the state was the Iowa highpoint (Hawkeye Point) and nearby campground in the north of the state in January. I skied up some dude’s driveway to 1670′ above sea level. While this area had “hills”, the rolling hills were nothing of note. I victoriously skated across a mowed lawn with icy snow to stand on the grand summit, observing the people of the corn below. Afterwards I skated around some fields and pretty old farm equipment. Skiing down the dude’s driveway was really extreme, just thrilling. 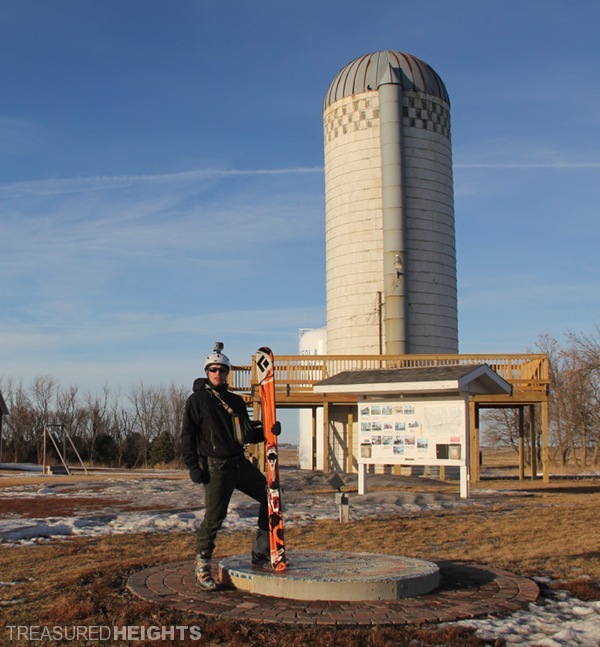 Further research led me to discover that the actual best terrain in Iowa for skiing is along the major river edges on the far east and west of the state. With only a few inches of snow and not much time I’d have to explore another time. Another time: While strolling through the beautiful old town of Omaha, Nebraska near the Iowa border I spoke with people about the town, a city I knew nothing about but was amused by its glowing bright skyscrapers, friendly people and sense of total isolation from any coast or major city. It was here, late at night under the glow of the skyscrapers that a local clued me in about the nearby Hitchcock Nature Preserve. Given that it was late enough for the weirdos to wander the street and all the well-to-do blond Omaha families were leaving the restaurants to go home, I figured it would be a good time to leave the city and head for the dark forest preserve to get some comfortable sleep in the back of my tiny Honda civic. 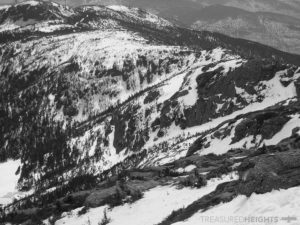 I can imagine a fun ski trail touring along this exposed ridge. I awoke to blue sky and lush green forest. I decided to check out the ski area at Mt. Crescent. This was a great hill for cruising and learning to ski, it was small, but not too small to not be fun. What I was really after was the backcountry here. The cicadas blasted their songs loudly in the humid summer heat. After some moderate bushwhacking through stinging nettles I emerged on the top of greatest line I’d seen for hundreds of miles. 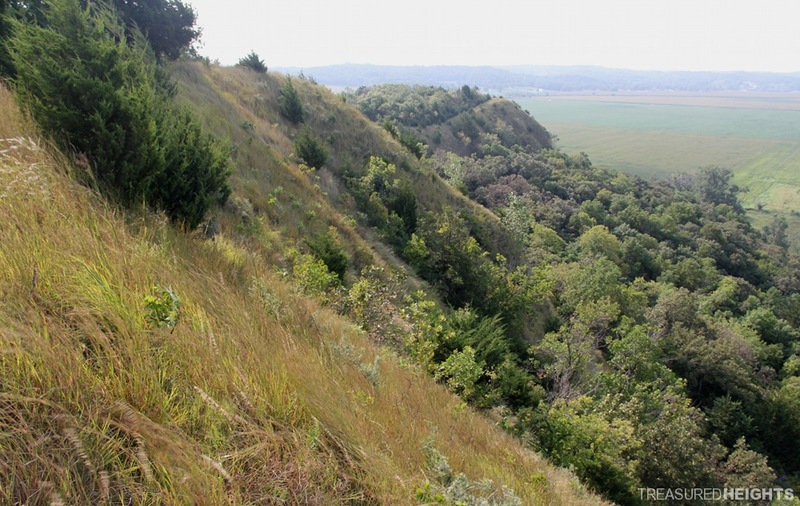 This was a perfect steep grassy slope leading all the way down to the Missouri River. The 300 feet of sustained 40 degree slope was flawless, with gullies and ridges (shall we call them Iowa “spines”, kind of like Cugach Spines, but not really). I would have loved to have a feature like this close to my house when I was growing up skiing all the steepest farm fields and wooded ravines. There were many short steep bald lines along the eastern bank of the Missouri here. I climbed a small mountain which finished with the top 30’ “above treeline”. Many bald ridges stretched out to the north. Each one had nice steep hardwood gullies to ski and flowing wavy grassy ridges. This was like a tiny model of a mountain range, everything in miniature! This sure beats the typical rounded wooded 300’ hill you find all over the place. These clay eroded hills were tall enough to make you feel distant and high off the 2D farmscape below. Well I’d love to have video of skiing some of the lines here, however I was here at the wrong season, and you’d need to wait until a good snow month to hit them, so hopefully someday a good skier from the area will get some cool photos of ripping down Iowa’s mini mountains. Iowa protects a very small percent of its land area, and almost all of these preserves are state or county owned. The Hitchcock Nature Center for example is run by the The Pottawattamie County Conservation Board. Many of Iowa’s parks are run by a small group of dedicated conservationists. If more of these preserves could grow and interconnect we’d have a lot more area for multi-use, and a larger area to absorb and clean agricultural runoff from streams flowing into the rivers. Touring through here would be fun with some snow. Hitchcock Nature Center. Outside of the western edge of the state we’ve got more valleys to explore in the Yellow River State Forest and Upper Mississippi River National Wildlife and Fish Refuge. If by Dubuque check out the Horseshoe Bluff formation. South of there you can get the view from Bellevue State Park. While normally I don’t talk about life serviced skiing in Treasured Heights I’ll make an exception here. 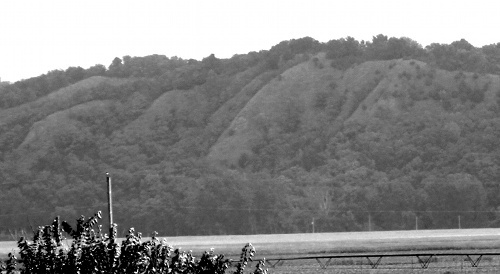 This mini-mountain sprung up on the side of picturesque Iowa valley with corn below and forest on the slopes above. The place looks like a lot of fun with small trails that wrap around and direct fall line runs that are high enough to get in turns. The next time you are crossing the midwest after a storm stop by Mt. Crescent. Then later throw on your skins and ride the rollercoaster ride of trails on the ridges of Hitchcock Preserve. No formal resources, but as I mentioned in the article the steep slopes of the Hitchcock Nature Preserve, or other big hills on the eastern side of the state have slopes at the ideal slide angles of 30-45 degrees. It’s likely that if a slide happens here on the grassy slopes that the entire snowpack will slide down to the smooth grass surface. Terrain traps are certain at the bottom of the slopes as they all funnel into trees or icy rivers. The Iowa episode of Skiing States is in production. Like our Facebook page to watch for release times.